Media captionAndrew Harding says it has been "a day of graphic testimony"
Oscar Pistorius vomited in court as he heard a pathologist's testimony about the nature of his girlfriend's injuries after he shot her dead. Pathologist Gert Saayman told the court that Reeva Steenkamp was shot three times, in the head, hip and arm. The judge had earlier banned live broadcast of the post-mortem examination testimony. Hunched over, with his arms over his head, Oscar Pistorius retched as Professor Gert Saayman gave a detailed account of the injuries his girlfriend sustained on Valentine's morning 2013. In a warm courtroom Dr Saayman revealed that the "black talon" ammunition used was "designed to cause maximum damage". Black talon bullets open up into a petal-like shape upon impact, the razor sharp edges causing extensive damage to whatever they hit. They are not standard-issue bullets but are widely available at gun shops. Dr Saayman also revealed how incapacitating Reeva Steenkamp's injuries would have been had she survived, causing Mr Pistorius more distress. The courtroom was silent as the pathologist spoke, punctuated by the sounds of the athlete vomiting. The court had adjourned earlier to allow him to compose himself but the break did not help. Judge Masipa, seemingly worried, asked if Mr Pistorius was coping. His lawyer Barry Roux told the court he wanted the proceedings to continue. Mr Pistorius' body jerked and he retched as he heard the pathologist's evidence, reports the BBC's Pumza Fihlani at the court in Pretoria. A bucket was placed next to Mr Pistorius, who broke down in tears on several occasions, leading the judge to briefly halt proceedings. The pathologist described how the wounds on Ms Steenkamp's body were consistent with bullets being fired through a wooden object such as a door. The wounds to her arm and hip could have killed her because of the extent of the bleeding, Mr Saayman said. He added that the bullets used were a "black talon" type, designed to cause maximum tissue damage. The pathologist also said that Ms Steenkamp had eaten within two hours of being killed. Our correspondent notes this seems to contradict Mr Pistorius' account - that the couple had been in bed for several hours before he woke, thought there was an intruder and mistakenly shot the 29-year-old model and aspiring lawyer four times through the toilet door. After the trial was adjourned for the day, the athlete remained slumped in the dock for several minutes being comforted by family members. "Very personal nature of the findings"
"Graphic details of the injuries have the potential to compromise the dignity of the deceased"
"Goes against the morals of society"
The judge also banned coverage of the details of the post-mortem examination through Twitter and other social media, but did allow the media to summarise the evidence after it was given. Large parts of the trial have been televised - a first for South Africa - but there are some media restrictions in place. Pieter Baba said he had phoned Mr Pistorius and not the other way round, as the defence team had suggested. Mr Pistorius said he and Ms Steenkamp had dinner at about 19:00 before going to bed at 21:00. 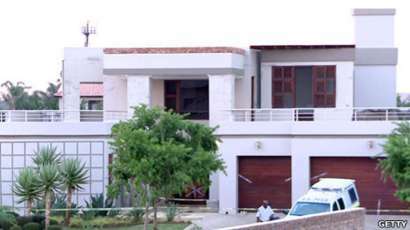 He said he woke in the early hours, spoke briefly to his girlfriend and got up to close the sliding door and curtains. Judge Thokozile Masipa questioned the reliability of several witnesses who said they heard screams and gunshots between about 03:12 and 03:17, saying most had 'got facts wrong'. Mr Pistorius said he heard the bathroom window sliding open and believed that an intruder, or intruders, had entered the bathroom through a window which was not fitted with burglar bars. Mr Pistorius said he grabbed his firearm and told Ms Steenkamp, who he thought was still in bed, to call the police. The judge said it made no sense that Ms Steenkamp did not hear him scream 'Get out' or call the police, as she had her mobile phone with her. 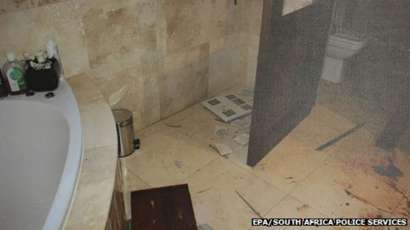 Mr Pistorius could see the bathroom window was open and toilet door closed. He said he did not know whether the intruders were outside on a ladder or in the toilet. He had his firearm in front of him, he heard a movement inside the toilet and thought whoever was inside was coming out to attack him. 'Before I knew it, I had fired four shots at the door,' he said. The judge said she did not accept that Mr Pistorius fired the gun by accident or before he knew what was happening. She said he had armed himself with a lethal weapon and clearly wanted to use it. The other question, she said, was why he fired not one, but four shots before he ran back to the room to try to find Ms Steenkamp. Mr Pistorius said he went back to the bedroom and noticed that Ms Steenkamp was not there. Mr Pistorius said this was when he realised she could have been in the toilet and rushed back to the bathroom. Mr Pistorius said he screamed for help and went back to the bathroom where he found the toilet was locked. He returned to the bedroom, pulled on his prosthetic legs and turned on the lights before bashing in the toilet door with a cricket bat. When the door panel broke, he found the key and unlocked the door and found Ms Steenkamp slumped on the floor with her head on the toilet bowl. He then carried her downstairs, where he was met by neighbours. If found guilty, the 27-year-old, a national sporting hero dubbed the "blade runner" after having both lower legs amputated, could face life imprisonment. On Friday Mr Baba, a security guard working at Mr Pistorius' gated community, spoke of his shock at seeing Mr Pistorius carrying a dying Ms Steenkamp down the stairs at the athlete's villa. Mr Baba said he had called Mr Pistorius in response to neighbours' reports of gunfire from the house in the early hours of the morning. The guard said Mr Pistorius had told him: "Everything is fine," before calling him back a few minutes later and crying down the phone. On Monday, Mr Pistorius' defence lawyer suggested the athlete had called Mr Baba first and not the other way round, but the witness stuck to his testimony. Mr Pistorius' lawyer, Barry Roux, then suggested his client had said: "I am fine," and not: "Everything is fine," but again the witness said this was not true. "My Lady, what I just told the court is the truth," Mr Baba told the judge.